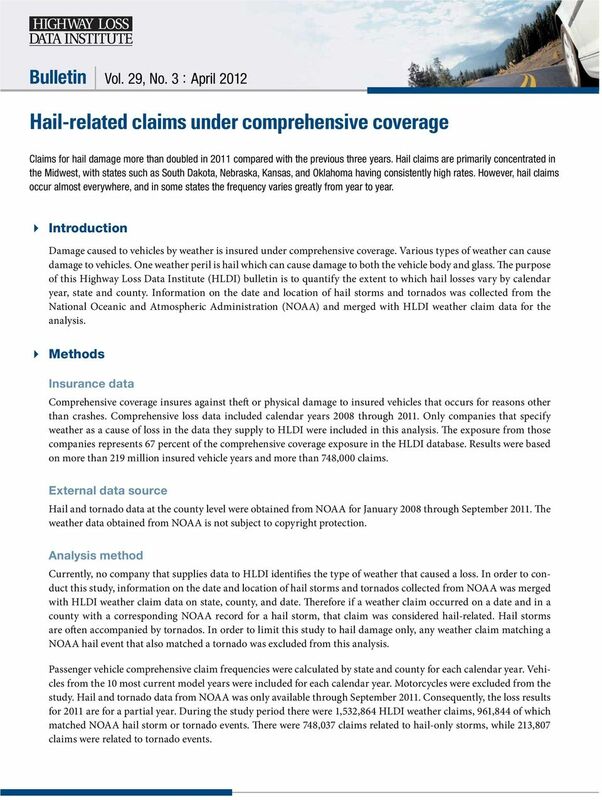 Download "Hail-related claims under comprehensive coverage"
1 Bulletin Vol. 29, No. 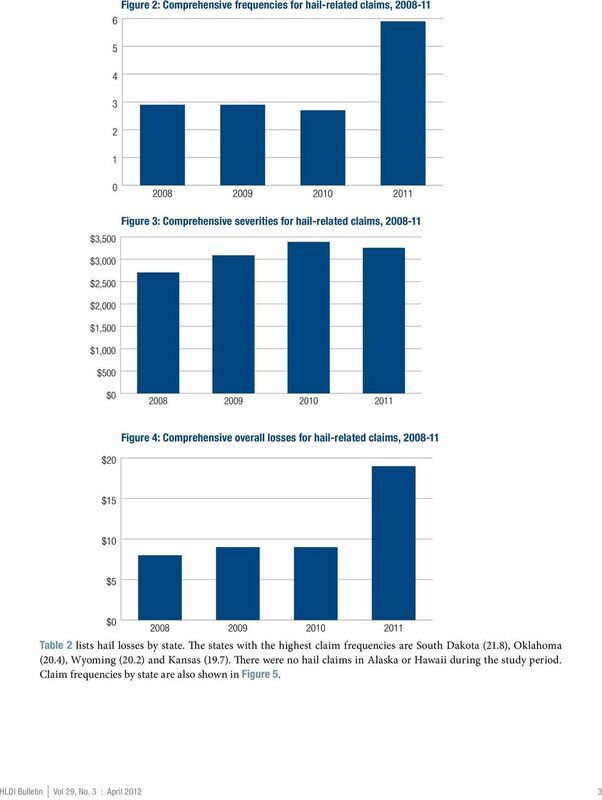 3 : April 2012 Hail-related claims under comprehensive coverage Claims for hail damage more than doubled in 2011 compared with the previous three years. 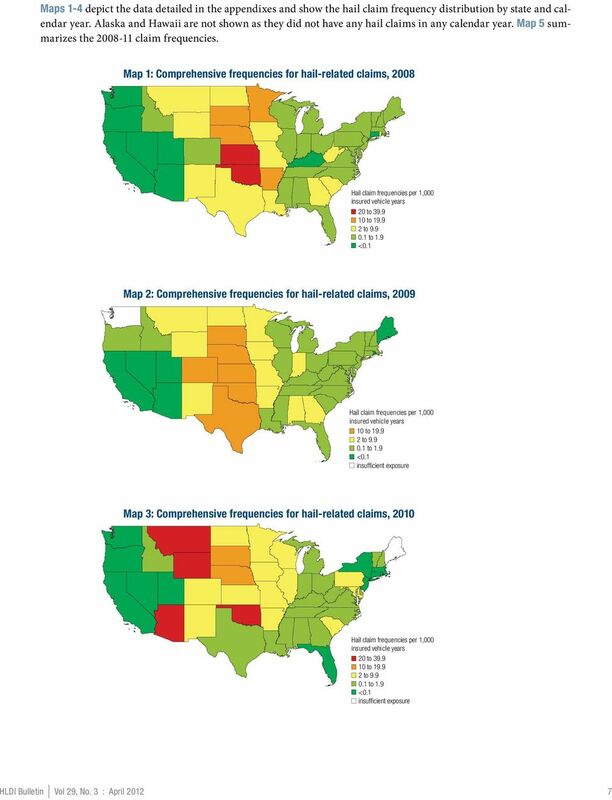 Hail claims are primarily concentrated in the Midwest, with states such as South Dakota, Nebraska, Kansas, and Oklahoma having consistently high rates. 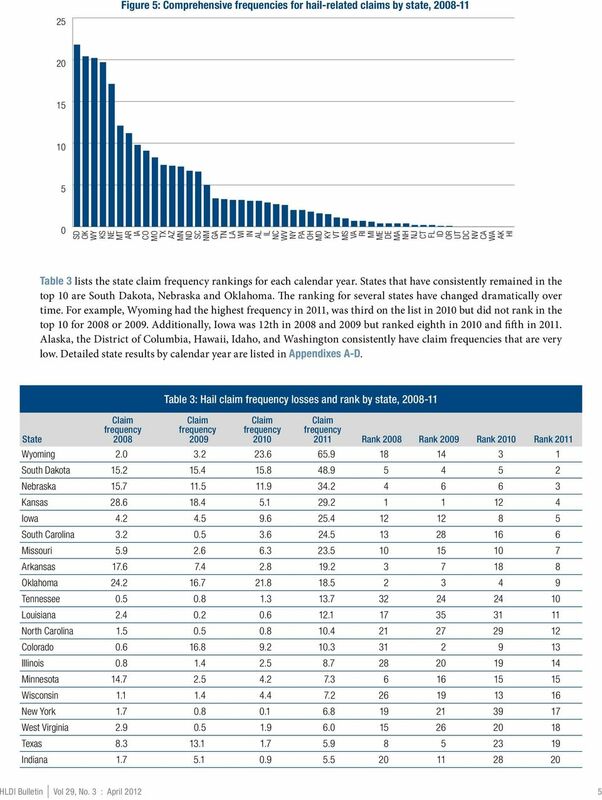 However, hail claims occur almost everywhere, and in some states the frequency varies greatly from year to year. Introduction Damage caused to vehicles by weather is insured under comprehensive coverage. Various types of weather can cause damage to vehicles. One weather peril is hail which can cause damage to both the vehicle body and glass. 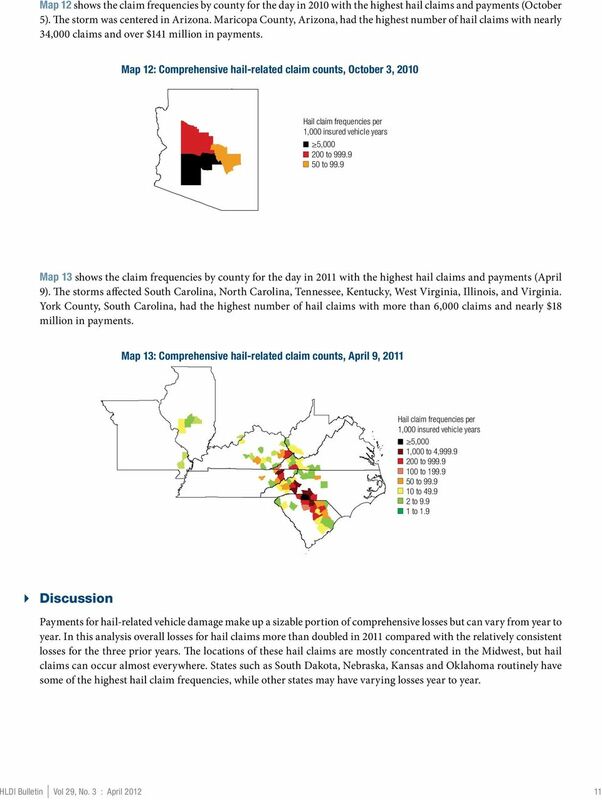 The purpose of this Highway Loss Data Institute (HLDI) bulletin is to quantify the extent to which hail losses vary by calendar year, state and county. Information on the date and location of hail storms and tornados was collected from the National Oceanic and Atmospheric Administration (NOAA) and merged with HLDI weather claim data for the analysis. Methods Insurance data Comprehensive coverage insures against theft or physical damage to insured vehicles that occurs for reasons other than crashes. 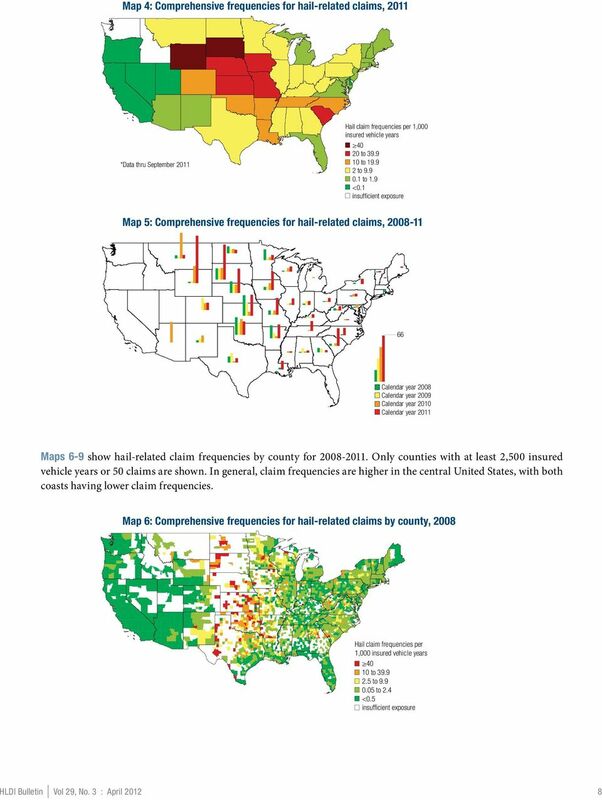 Comprehensive loss data included calendar years 2008 through Only companies that specify weather as a cause of loss in the data they supply to HLDI were included in this analysis. The exposure from those companies represents 67 percent of the comprehensive coverage exposure in the HLDI database. 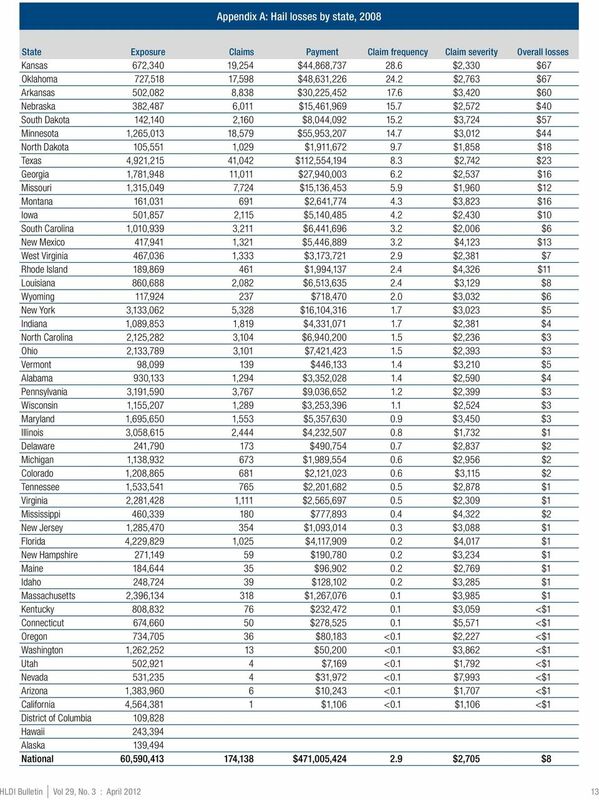 Results were based on more than 219 million insured vehicle years and more than 748,000 claims. 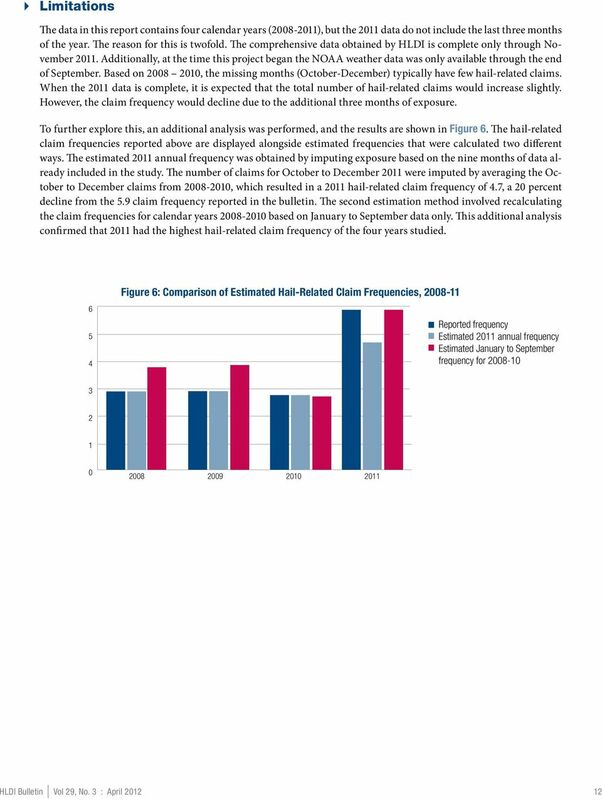 External data source Hail and tornado data at the county level were obtained from NOAA for January 2008 through September The weather data obtained from NOAA is not subject to copyright protection. Analysis method Currently, no company that supplies data to HLDI identifies the type of weather that caused a loss. 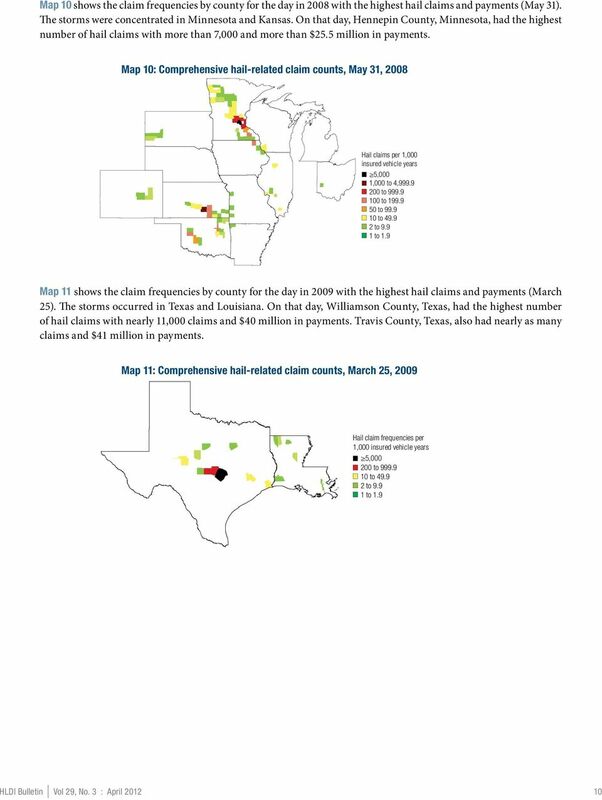 In order to conduct this study, information on the date and location of hail storms and tornados collected from NOAA was merged with HLDI weather claim data on state, county, and date. Therefore if a weather claim occurred on a date and in a county with a corresponding NOAA record for a hail storm, that claim was considered hail-related. Hail storms are often accompanied by tornados. In order to limit this study to hail damage only, any weather claim matching a NOAA hail event that also matched a tornado was excluded from this analysis. 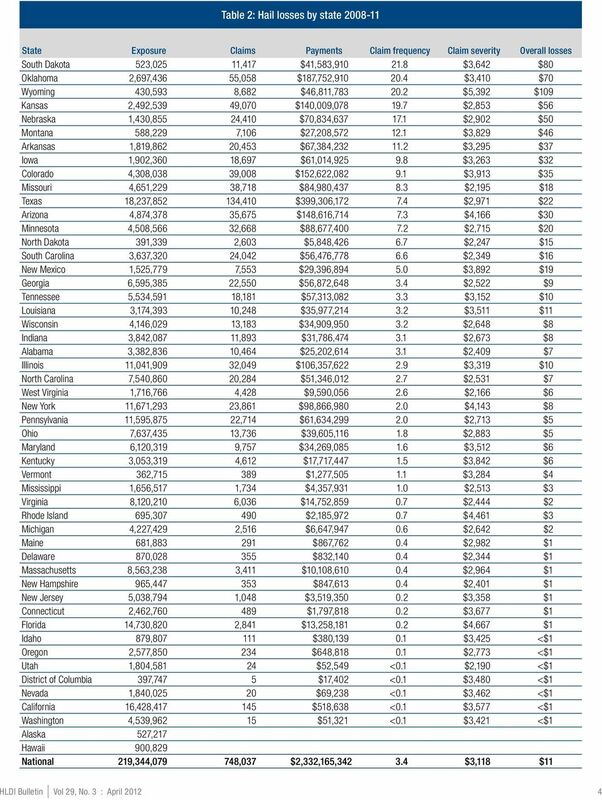 Passenger vehicle comprehensive claim frequencies were calculated by state and county for each calendar year. Vehicles from the 10 most current model years were included for each calendar year. Motorcycles were excluded from the study. 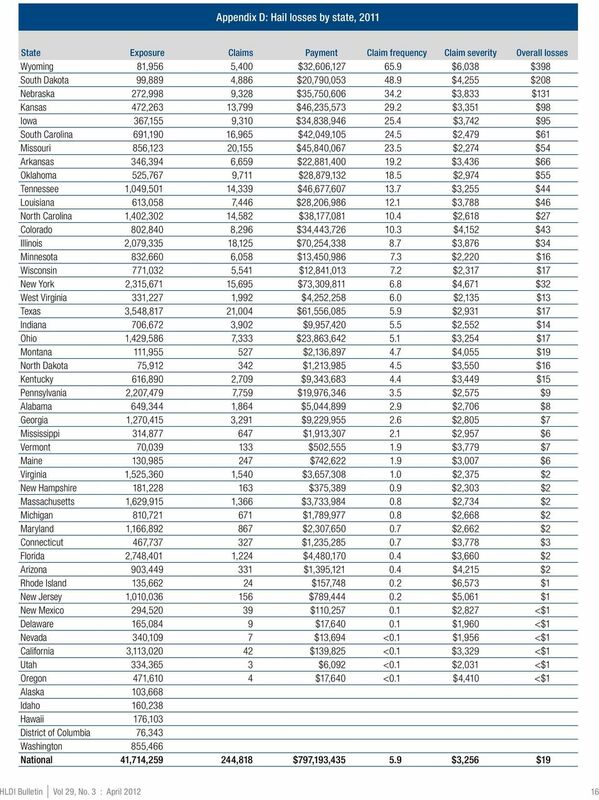 Hail and tornado data from NOAA was only available through September Consequently, the loss results for 2011 are for a partial year. During the study period there were 1,532,864 HLDI weather claims, 961,844 of which matched NOAA hail storm or tornado events. There were 748,037 claims related to hail-only storms, while 213,807 claims were related to tornado events. 17 The Highway Loss Data Institute is a nonprofit public service organization that gathers, processes, and publishes insurance data on the human and economic losses associated with owning and operating motor vehicles N. Glebe Road, Suite 700 Arlington, VA USA tel 703/ fax 703/ iihs-hldi.org COPYRIGHTED DOCUMENT, DISTRIBUTION RESTRICTED 2012 by the Highway Loss Data Institute. All rights reserved. Distribution of this report is restricted. No part of this publication may be reproduced, or stored in a retrieval system, or transmitted, in any form or by any means, electronic, mechanical, photocopying, recording, or otherwise, without the prior written permission of the copyright owner. Possession of this publication does not confer the right to print, reprint, publish, copy, sell, file, or use this material in any manner without the written permission of the copyright owner. Permission is hereby granted to companies that are supporters of the Highway Loss Data Institute to reprint, copy, or otherwise use this material for their own business purposes, provided that the copyright notice is clearly visible on the material. WHAT STATES IS IT ILLEGAL TO DO BPO S? 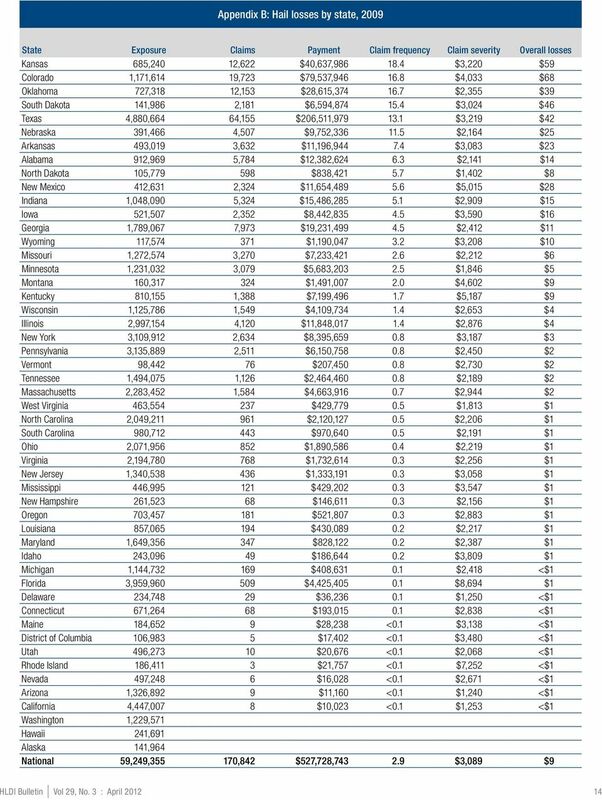 VCF Program Statistics (Represents activity through the end of the day on June 30, 2015) As of June 30, 2015, the VCF has made 12,712 eligibility decisions, finding 11,770 claimants eligible for compensation. Foreign Language Enrollments in K 12 Public Schools: Are Students Prepared for a Global Society? Center for Community College Policy Education Commission of the States Community College/Technical Institute Mission Convergence Study Phase 1: Survey of the States Prepared by Donald E. Puyear, Ph.D.
Pooling of Risk In applying rating factors, carriers will group policyholders into classes and blocks of business. 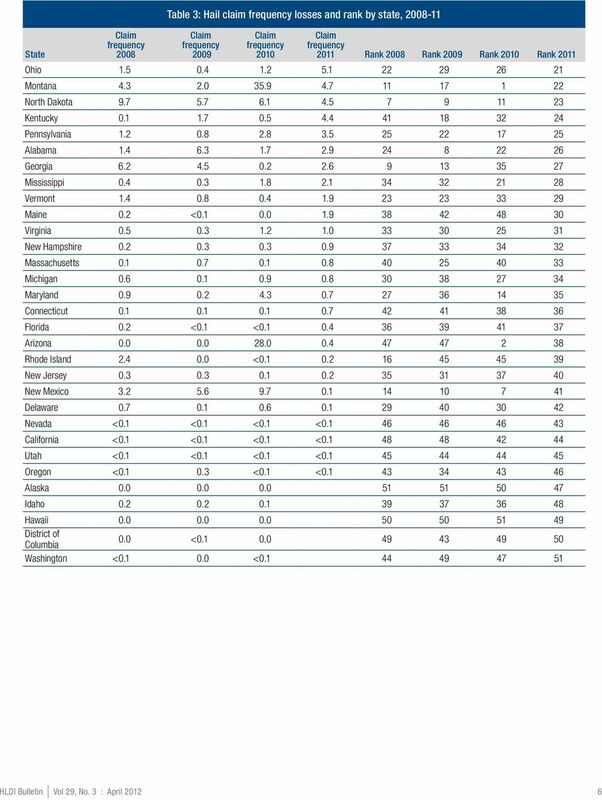 Arizona Reaching International Competitiveness by 2025 National Center for Higher Education Management Systems Differences in College Attainment (Associate and Higher) Between Young and Older Adults U.S.
Rates are valid through March 31, 2014. 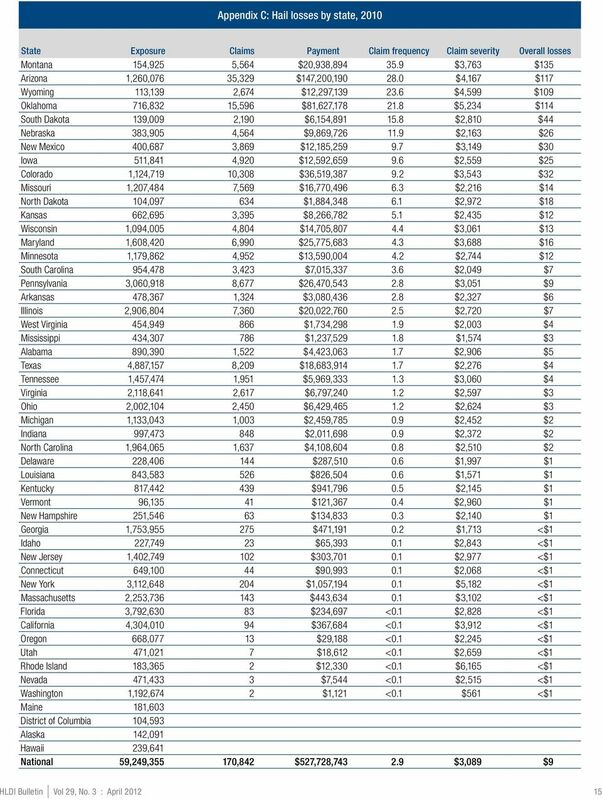 The data in this chart was compiled from the physician fee schedule information posted on the CMS website as of January 2014. CPT codes and descriptions are copyright 2012 American Medical Association. *Time is listed as approximate as an offender may be charged with other crimes which may add on to the sentence.